It's deceptivly hard to save baby birds. So on a cute scale from 1-10, 1 being a table (an inanimate table, with no face drawn on) and 10 being a naked baby, I would give Bird Week an 8. 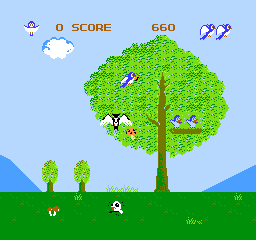 Here's how it goes: You're a Mommy Bird, flying through an orchard or bird farm or something. There are butterflies flying around, and you have to try to catch one in your mouth beak. On every tree you pass sit two baby birds. Sometimes they are content, and sometimes they are cutely squawking. If it is the latter, you have to pacify it by puking the butterfly into its mouth. The biggest reward of the game is when a baby grows up and leaves the nest. It's beautiful and makes me proud to be a Mommy Bird. But don't think that this game is all catching bugs and puking on babies. Oh no, there are predators. Beware of the giant crows ravens blackbirds who are accompanied by squirrels chipmunks in the more advanced levels. The tiny woodland creatures can be awfully inviting, frolicing and playing and whatnot, but you must resist the cuteness. Remember the dancing daisies in Yoshi's Island? 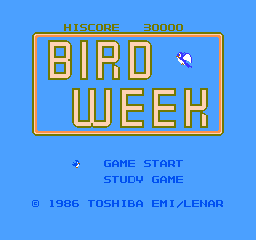 The graphics in Bird Week are simple, but well designed for an older game. It's easy to tell which birds are good (baby bluebirds) and which birds are bad (scary blackbirds). Your only change in scenery is the seasons changing. You're flying through the same place, just in Spring, Summer, Fall, and Winter (these birds don't fly South). The music is whimsically mono, just as any other Nintendo game. A different song plays when you feed a baby, another when a baby grows up and flies away. This is one of my favourite games because of the cute factor and how easy it is to play. It's challenging enough not to be boring, but it's easy enough that you don't have to be "in the zone". I recommend it to young children, girls of any age, moms, dads, or anyone who likes to nurture babies. I noticed a bird yesterday trying to catch a butterfly. He was having trouble with it, so maybe he could benefit from Bird Week, as well.